Stunning seafront views of Casablanca Marina are available from the shared and private flexible office options at this modern business centre. With hot-desking options, this adaptable work space also provides high-speed internet, lounge access, administrative/IT support and parking facilities. Great transport links are available with the centre just five minutes from the Casa Port train station, while the airport can be reached in around 45 minutes. This business centre provides views overlooking the sea-front within Casablanca's beautiful commercial district. 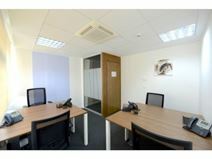 Offices are available on flexible terms at affordable prices with a range of useful services at your disposal. These include super fast WiFi connection, serviced meeting rooms for collaborative purposes, a luxurious business lounge and a professional reception team operating the front desk. The area is home to many local amenities including fitness centres, restaurants, supermarkets and shopping centre. Transport links are substantial, a 5-minute journey from the Casa Port train station and a short 45-minute drive from the International Airport. Right in the middle of Casablanca, this centre provides a variety of work space solutions in an area known for its art deco legacy. High-speed Internet, convenient on-site parking and access to lounge areas come as standard. Other amenities such as air-conditioning, IT support, communal breakout areas are also available to be taken advantage of. The centre is maintains 24-hour access, an ideal opportunity for employees working with associated abroad. The location is convenient, close to several large roads and substantial public transport links including the downtown train stations. Additionally, the centre is close to an abundance of local amenities including restaurants, banks, hotels, bars and museums. 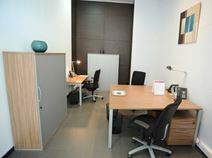 Offering modern office spaces this business centre located in the economic capital of Casablanca is found in an ideal location. The centre offers a variety of office spaces which come beautifully furnished and fully equipped with the best technology to keep you connected. You will have access to high speed and reliable internet, and a friendly and approachable administration team to support you through the day with mail handling, telephone answering and greeting guests. Convenient car parking is offered on-site for you and your clients and professional meeting rooms can be booked out easily. You will also benefit from communal areas including the kitchen and break/lounge areas. The centre is easily accessible by road or public transport where you can jump on one of several trams that pass through the area frequently. 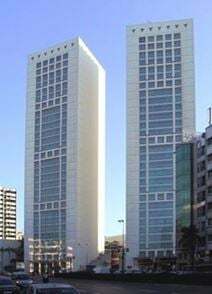 The two buildings are the tallest office buildings in Morocco, which will give your business a strategic, recognised presence. his highly accommodating centre will facilitate the success of businesses of any background, with 93,000m2 of offices and have their own atrium 7.2 meters high, 15 elevators, 24 hour access/security, car parking, catering, flexible terms, furnished offices, kitchen, meeting rooms and a friendly on-site reception team. This space is also conveniently located next to a range of local amenities, from restaurants to retail outlets. This stunning corporate building with an angular glass façade is home to this centre that provides serviced office space, professional meeting rooms and a variety of business support services, all within the central business district. Professional amenities available at this business centre include; spacious meeting rooms, high bandwidth internet, business lounge areas and IT support. In terms of location this centre is well situated in the heart of the commercial district, with great access to public transport links and an abundance of local amenities including plenty of restaurants, bars, hotels and retail outlets. 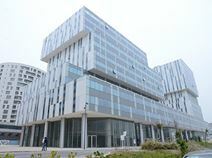 From the heart of Casablanca this new centre is in a contemporary building that supplies plenty of natural light. The town centre is within a five-minute walk while the centre itself provides meeting rooms, serviced office space and convenient parking. The business centre also maintains 24-hour access, high-speed internet, CCTV, business lounge areas and fully equipped meeting rooms. Furthermore, the centre is ideally situated in a bustling district of Casablanca, nearby to several other commercial entities, as well as a diverse range of useful local amenities including retail outlets, restaurants, hotels and stylish bars. Casablanca is the economic powerhouse of a business-friendly country. Stand-out architecture including buildings in stunning white with tinted glass-frontages, plus world-class support services, which continue to attract multinationals here. Those companies include many outsourcing service providers in sectors such as customer relationship management, human resources, IT, finance, supply chain management, consulting and training. Part of Casablanca Marina this modern building is part of a unique seafront environment. Only 10 minutes from the train station and half an hour from the international airport the area is home to the laregst mall in Morocco, a convention centre and a large range of hotels. This turnkey solution will enable your company to flourish exponentially with its array of excellent facilities. Its impressive reception area has an abundance of natural light, and the interior working spaces are designed to an outstanding degree. This spectacular landmark building features two twin skyscraper towers that overlook the busy and exciting commercial hub of Casablanca. Your business can benefit from a prestige business address that will give your company a strategic presence in addition to premium amenities, including fully furnished, well designed interiors, 24 hour access and business lounge access. Numerous transport networks are available, including both a train station and an airport within a mile of the building. 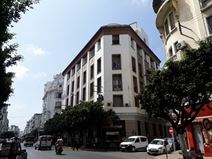 This office space is proudly situated within a landmark building in Casablanca’s business vicinity, providing a perfect commercial environment. Special care has been taken to provide the best in architecture, technologies and support for your business. 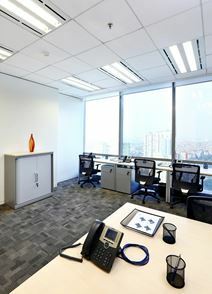 This office provides a spacious lounge, underground parking, vending machines and sandwich services. Convenient location with countless amenities in the vicinity and also provides excellent link for various transportation options. This modern business centre is situated in central Casablanca and provides a range of office-spaces that are available on flexible terms. The building offers spacious meeting rooms, relaxing break-out areas and high-speed internet. Accessible 24-hours a day, it is possible to tailor this centre to suit individual business requirements. In addition, a professional reception service are present, and able to deal with administrative duties as well as greet clients with a friendly face. In terms of transport, the local train station is easily located, as well as the International Airport being situated very nearby. The surrounding areas are filled with local amenities including local restaurants and retail parks. This business centre is easily accessible from all the highway routes and the main avenues of the city, local bus services all run through the area. Here, your business will have access 24 hours to a personal office suite, board/meeting room facilities, and break out area. There is an on-site cleaner that will ensure that your working environment is at its best condition everyday. There is also a local parking lot located a 3-mintue walk away from the center, making it as accessible as possible after a pleasant commute. This centre is well situated in a bustling commercial district of Casablanca, with a range of office solutions available on flexible terms. Amenities here include private meeting rooms, high speed internet and primary access to a luxurious business lounge for those working on the move. In addition, the area is home to many local amenities including stylish bars, restaurants and hotels. The connections via public transport are substantial as well, with local bus, train and tram routes circulating nearby. Offering bright, spacious and modern office spaces in Morocco's first successful business park, this building is located in the vibrant neighbourhood of Zenith. The building offers a great selection of office solutions, including private offices, coworking spaces and virtual office options. Meeting rooms and training rooms can be easily accessed and used flexibly. The terms are affordable and flexible, including a range of amenities such as 24 hour access. With five offices available on flexible terms from one day to one month or longer this typical Haussmann-style building is located in the heart of Casablanca close to the railway station. The light and bright spaces have terraces and balconies. Professional services available at this address include 24-hour access, high-speed internet, copy & printing facilities, a dedicated reception and a professional maintenance service. In terms of location, this centre is ideally situated in the centre of Casablanca, surrounded by an abundance of local amenities. These include an array of retail outlets, restaurants and stylish bars. Local goods can also be sourced from the adjacent market. Public transport links are numerous, with the railway station and Airport being easily accessible from this prestigious address. In the main industrial area of Casablanca this Ain Sbaa business centre is fully equipped and serviced and allows tenants quick and easy access to major factories and plants in the surrounding area. On-site parking makes access from road easy while the train station is just five minutes away. The centre also offers a fully stocked refresh bar and convenient on-site parking which is available for both yourself and your clients. 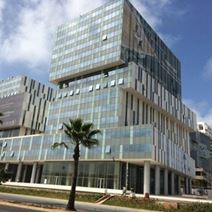 Surrounded by industry giants in retail, telecoms and e-commerce this modern business centre is housed within a landmark Casablanca skyscraper. On-site staff help to support your business while tenants have access to shared office space, private offices and fully furnished executive suites. Furthermore there is fantastic transport links with immediate access all around the city as well as to neighbouring towns and cities via train, tram and road. Surrounded by international businesses within Casablanca's banking, financial and insurance sector, this modern business centre offers a range of private and shared flexible office solutions complemented by fully equipped meeting rooms and a business lounge. Furthermore, there are on-site staff available to help with your day-to-day business requirements as well as providing a voicemail and reception service so that your business can operate as efficiently as possible. 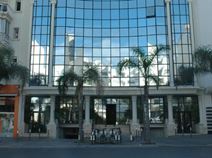 Located in a prestigious area of Casablanca, this business centre is found in a tower block comprising of 25 floors. Offering a range of clean, spacious and open work stations this is the ideal place to be productive and work efficiently as a professional. The costs and terms are both affordable and flexible, with excellent services including 24 hour access, personalised reception services and high speed internet. There are a range of eateries in the surrounding area as well as excellent public transport links.